ANGEL STREET CAPITAL INVESTS IN AIRKAST, INC.
Angel Street Capital recently completed an investment in AirKast, Inc.’s Series A Preferred Stock offering. AirKast develops mobile applications which run on its AirBridge platform. One of the industry verticals it has targeted includes Internet radio. 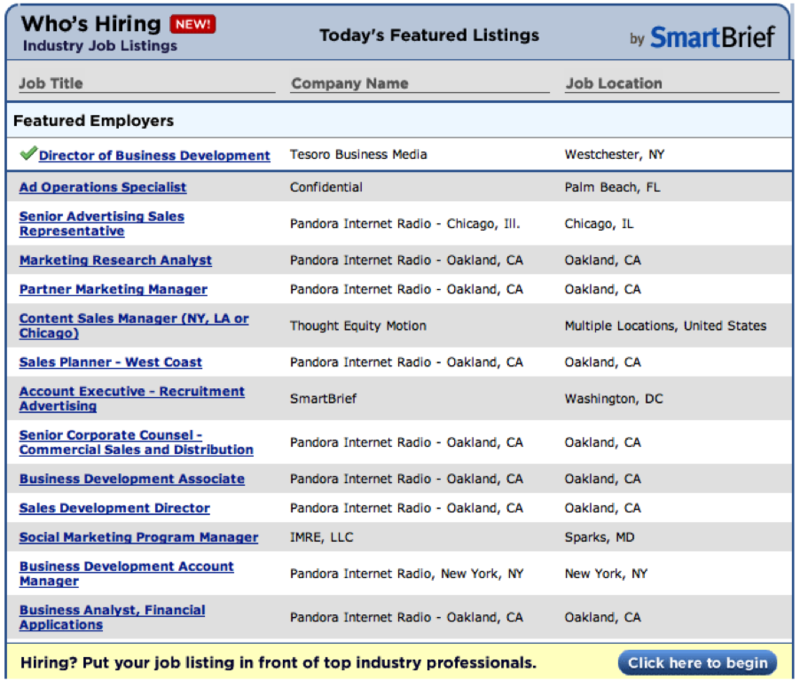 AirKast clients include many of the leading radio companies. The company’s TuneKast offering allows stations to stream their content as part of its application. Clients include ESPN, Radio Disney, Citadel Broadcasting, Salem Communications and many more. Members of Angel Street Capital have previously invested in earlier AirKast funding rounds. The company is growing rapidly and is well positioned to take advantage of the explosive growth occurring in mobile. http://www.angelstreetcapital.com/images/logo.png 0 0 Robert Maccini http://www.angelstreetcapital.com/images/logo.png Robert Maccini2011-06-03 13:15:502014-04-06 06:53:18ANGEL STREET CAPITAL INVESTS IN AIRKAST, INC. Yesterday at the Radio Ink Convergence Conference in San Jose Slacker’s CEO stated they had 26 million listeners. In their IPO filing Pandora stated they had over 80 million registered users. I’m sure what Slacker’s CEO meant to say is that they have 26 million registered users. There is a big difference between registered users and audience. A large number of people may register and never use the service. Actual audience is measured by Ando Media (now Triton Digital). For the most recent data released, March 2011, Slacker and Pandora had an AAS of 39,697 and 599,214, respectively for the time period Monday-Friday 6 AM – 8 PM. AAS is defined at Total Listening Hours (TLH) divided by the number of hours in the reported time period. TLH is defined as the total number of hours that the station has streamed during sessions with a duration of at least one minute in total within the reported time period. AAS in general reflects the average number of people listening. For Slacker and Pandora this represents .15% and .75% respectively of their registered users. Both companies cannot monetize registered users, it’s the audience that actually use the service that matters. There has been a significant amount of publicity since Pandora filed their S-1 to go public on 2/11/11. Based on data available I have taken a deeper dive into their content acquisition, primarily Sound Exchange royalty rates and payment. The bulk of Pandora’s revenue is generated from advertising. Advertising is based on audience size. In the most recent Ando Media, LLC (now rebranded as Triton Digital – Ando Media is the de facto standard for Internet radio audience measurement and for full disclosure a firm I co-founded) February 2011 Top 20 Ranker Pandora generated a 495,055 AAS for the time period Monday-Sunday 6 AM- Midnight AAS or Average Active Sessions is defined as “The total listening hours divided by hours in the reported time period”. The February report did not fully measure some of Pandora’s mobile streams so listening for February actually declined from January. Taking the average for the last three months (Dec-Feb) results in an AAS of 520,083 for that time period. So let’s assume the average song length is 3.5 minutes and assume promo/ads of 2 minutes per hour. This would result in Pandora playing 16.6 songs per hour. In the parlance of Sound Exchange, based on Pandora’s audience there would be 8.6 million performance per hour x 24 = 206 million per day x 30 = 6.2 billion performances monthly. At the $.00102 performance royalty rate per song this equates to $6.3 Million per month in music royalties or $76 Million per year. Pandora reported content acquisition costs for the 12 months ending 1/31/11 of $69,357,000. While I believe the majority of this expense represents sound exchange royalties it most likely represents other expenses such as ASCAP/BMI. My estimate is based on more recent and higher audience levels. Also overnight listening is most likely lower than the 6 AM – Midnight daypart. From January 2010 – January 2011 Pandora’s audience increased 103%. If we assume Pandora’s audience grows by half this amount, 51.5%, Content Acquisition costs solely from Sound Exchange will increase to $96 Million (average monthly 2011 audience 656,830 x 16.6 x 24 x 30 x $.00102). Pandora was approximately break even for the period ending 1/31/11 with Content Acquisition costs of $69 Million. Based on my assumptions Pandora’s content acquisition costs will increase by $27 Million. Put another way net advertising revenue will have to increase by this amount to continue to break even. I don’t believe break even is the goal. Given the increase in royalty rates and assuming no increase in audience (probably not likely) Content Acquisition costs may increase each year (by $29 Million in 2012 and a little over $11 Million each year thereafter). One of the reasons Pandora has attained their position as the largest Internet radio service is their low ad spot load. Pandora does not report sellout rates for its ad inventory and there is also the option of running more ad inventory although this may have a negative effect on listening levels. Pandora is early in its life cycle and the optimal blend of ad inventory/size of audience to maximize revenue has not be determined. Pandora also generates other revenue that does not result in higher Content Acquisition Costs, e.g. display revenue. Recently concern has arisen surrounding the cost of mobile streaming. AT&T offers the following monthly data plans. Currently Verizon Wireless offers unlimited data usage for $30.00. However, their CEO during a telecom conference in March stated Verizon will move to a tiered pricing model during the summer. So what bandwidth is consumed when streaming? Let’s do some math. Bandwidth consumption depends on the quality of the stream typically expressed in kilobytes (“KB”) per second. Many stations stream at 32 KB per second so a user would consume 14 megabytes (“MB”) per hour ( 32 KB x 60 x 60 = 115,200 KB per hour, there are 8 bits in 1 byte so (32 x 6,600)/8 = 14,400 KB so 115,200 KB / 1,024 = 14.06 MB per hour). Let’s assume a listener spends 2 hours per day streaming music so this would consume 28 MB per day or 840 MB per month. There may be other data being transmitted which would increase the amount of bandwidth consumed. The average time spent per session listening to Internet radio on average is approximately 2 hours. However I believe time spent listening is lower on mobile devices. To be conservative we’ll keep the 2 hour per day assumption. Some wireless company websites actually has a calculator for determining data usage for various activities. AT&T assumes a streaming rate of 64 KB per second. Assuming 2 hours of listening per day resulted in consumption of approximately 2 GB. T-Mobile does not state what bitrate was assumed. Obviously mobile users also consume bandwidth for other purposes. I believe most mobile users are comfortable with paying $25.00 per month for 2 GB of data. So it appears that the cost of a monthly mobile phone bill is going to go up for Internet radio users. Most will need at least a 4 GB plan which would add another $20.00 per month. While cell companies lost the battle for control of content they do have pricing power and leverage. The combination of Verizon and T-Mobile, if allowed to occur by regulatory agencies will lessen competition and could lead to higher costs. I am rooting for more competition from the likes of Clearwire and LightSquared. Internet Radio Revenue – WHERE IS IT? Having been intimately involved in the Internet radio industry for many years (we were there at its birth), I am amazed that advertising revenue has developed so slowly. It was 2004 when we formed Net Radio Sales to represent stations in the sale of national Internet radio advertising and this period was also when TargetSpot (another rep firm/network) was formed as well. I estimate that national Internet radio revenue for 2010 was approximately $25MM. Using the 80/20 (local to national ad revenue) rule of thumb would mean that total Internet radio revenue is $125 MM. I question this number as streaming has been more effectively sold when stations are aggregated and thus far radio groups have been slow to figure out how this new medium is sold. Local stations don’t have the expertise (yes this is beginning to change) but local ad unit rates can often be much higher since in many instances it is sold on a sponsorship model rather than on a CPM basis. I estimate total non-Pandora internet ad revenue at $75MM based on my knowledge of what most groups are generating. Terrestrial Streaming – 1,750,000 total audience x 38% terrestrial streaming x 12 units x 18 hours per day x 7 days per week x 52 weeks x $3.00 CPM/ 1,000 = $156,855,000 in terrestrial streaming revenue. Many stations have the ability to run a synchronized banner when an ad is playing although not all have this ability. Some stations also rotate banners on their player which have no relation to an audio ad that is playing. We could assume a premium in-stream rate for synchronized audio but have chosen to use the rotating banner on the media player as our projection model. In total, Internet radio advertising has the potential of generating $415,835,280 in revenue. What is actually being generated is far less. Some analysts estimate that Pandora will generate $100 million in 2010 revenue. While Pandora has some subscription models and sells music generating revenue let’s assume 80% or $80,000,000 comes from advertising revenue. This means Pandora represents 19% of total potential Internet radio advertising. I believe Pandora at this point out bills the rest of their Internet radio competition combined. Adding my estimate of 2010 Pandora and non-Pandora ad revenue means total revenue $155 Million or a sellout rate of 37% for the industry. There is still a lot of unsold inventory. Inventory sellout rates need to be much higher before CPM rates move higher. It is interesting to note that terrestrial CPM rates are significantly higher at $12.00 (per Inside Radio). This makes little sense as Internet radio is much more accountable (exact measurement) and has the ability to target ads to a much higher degree. Why has ad revenue been so slow to grow? – I’ll deal with that in a later post. http://www.angelstreetcapital.com/images/logo.png 0 0 Robert Maccini http://www.angelstreetcapital.com/images/logo.png Robert Maccini2011-01-10 17:40:072014-04-06 09:38:44Internet Radio Revenue - WHERE IS IT? With terrestrial radio we had studies by Arbitron and others that broke down the composition of a format’s demographic audience (20% 18-34, Soft AC skewed more female, etc.). This information was based on data collected from the people who filled out a diary. Location based advertising was somewhat easier because a station’s over the air signal only covered a specific area and in many cases a defined Arbitron metro. Advertisers targeted audience based on format and market. Other qualitative information for the most part was missing or again was based on format. Location – at the very least based on IP address we can with about 80% accuracy know where a listener is located. Total accuracy can come from requiring audience registration (many station are reluctant to do this as they feel listeners will just click away to another station) or from the use of a cookie. As a result Internet radio has the ability to better target advertiser messages. In a mobile context, a 19 year old male could be served up an ad for a free slice of pizza when walking by House of Pizza at 4:30 pm. Targeting makes ads more efficient. However there is also a down side. When you start slicing segments of an audience you often have difficulty in generating enough impressions. This problem will be mitigated as Internet radio audience continues to grow. From a technology standpoint Ando Media, the largest Internet radio ad insertion company has a server side targeting system. Many companies such as Target Spot utilize a player based system. Player based systems have limitations as there are many ways of consuming Internet audio where a player does not exist (mobile and audio devices such as Sonos). Ad agencies are striving to be more efficient investing their client funds. Even if targeting did not exist with Internet radio you know that an ad was actually heard and where it was heard as compared with terrestrial radio’s estimate that it was heard – I believe this to be very powerful.